Boston wasn’t the only place to throw a tea party! Here, on March 2, 1775, Providence residents protesting the Tea Act threw 300 pounds of British East India Company tea into the Providence River. Finding inspiration in Rhode Island’s founder Roger Williams, residents sent their tea into the river and their spirit of protest across the Atlantic Ocean to King George. The Market House changed that day and hasn’t stopped. Following the event, the Market House quartered French soldiers during the Revolutionary War, and by the middle of the 19th century, it served as Providence’s City Hall before overcrowding necessitated a larger space in present day downtown. Over the years, the Market House also witnessed the largest natural disasters to hit Providence: the Great Gale of 1815 and the Great Hurricane of 1938. The Great Gale brought an eleven-foot storm surge, memorialized on the side of the Market House, that was unsurpassed until the Great Hurricane of 1938. 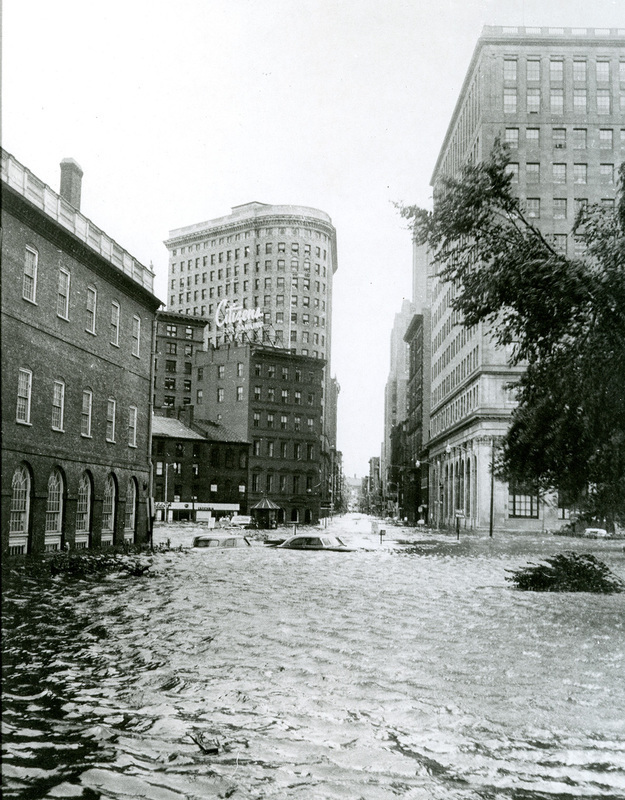 The Great Hurricane of 1938 was the largest modern disaster to affect downtown Providence. On September 21, the hurricane hit high tide and a tidal wave flooded the business district seven feet above street level. The storm hit at rush hour and hundreds of people eager to make their journeys home did not know they were stepping into one of the deadliest modern storms to ever strike New England. In all, 311 Rhode Islanders died, and the storm is remembered through hurricane markers located around downtown today. 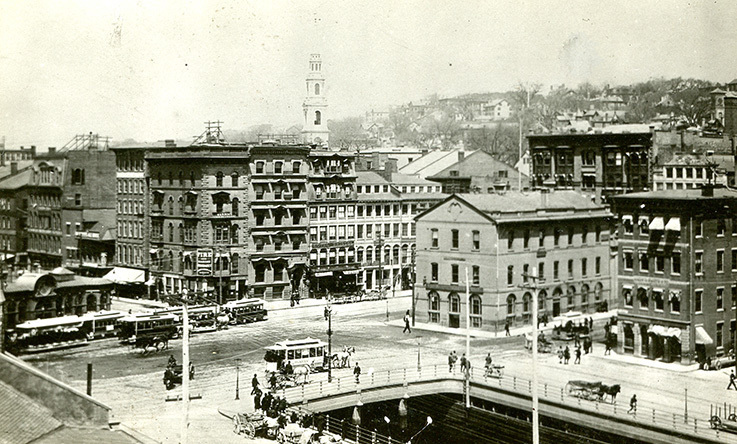 Market House in the Late 19th Century: Downtown has changed significantly over the years. Before the extensive River Relocation Project of the 1980s and 1990s, there were large bridges covering the rivers next to the Market House. Providence's past built environment emphasized its prominent industrial economy. Great Hurricane of 1938: The Great Hurricane of 1938 was the most significant natural disaster to affect Providence in the 20th century. As seen in this image, the flooding was so severe that entire cars were submerged. Check out the small pavilion just north of the Market House near the Providence River! The pavilion is part of the larger “Riverwalk Registers Project” completed by the Rhode Island School of Design (RISD) and the Rhode Island School for the Deaf. Students from the area created bands or “registers” of self-portraits, portraits of well-known Rhode Islanders, and images from the art collection at RISD. The artwork tiles cover the columns of the pavilion. A panel on the pavilion invokes the memory of Roger Williams, who founded a settlement here in Providence as a “shelter for persons distressed for conscience.” Tiles in 26 languages, including braille and sign language, remind the viewer of Williams’ intention. in founding Providence. Amelia Golcheski, “Market House,” Rhode Tour, accessed April 21, 2019, http://rhodetour.org/items/show/202.